Antinomy is on Kickstarter for just a couple more days! It’s fitting that Antinomy grants first player privileges to the person who has most recently experienced Deja Vu, because I feel like I just played this game. Button Shy kickstarted The Perfect Moment a couple of months ago and it had a similar time travel vibe to it. Indeed, for both games the idea of time travel is gamified by having the player swap cards in and out of decks and hands. It makes sense–if the cards represent moments in time, moving them around and accessing different cards is like time travel. Antinomy abstracts the ideas more than The Perfect Moment, creating a cleaner, more immediate game experience. 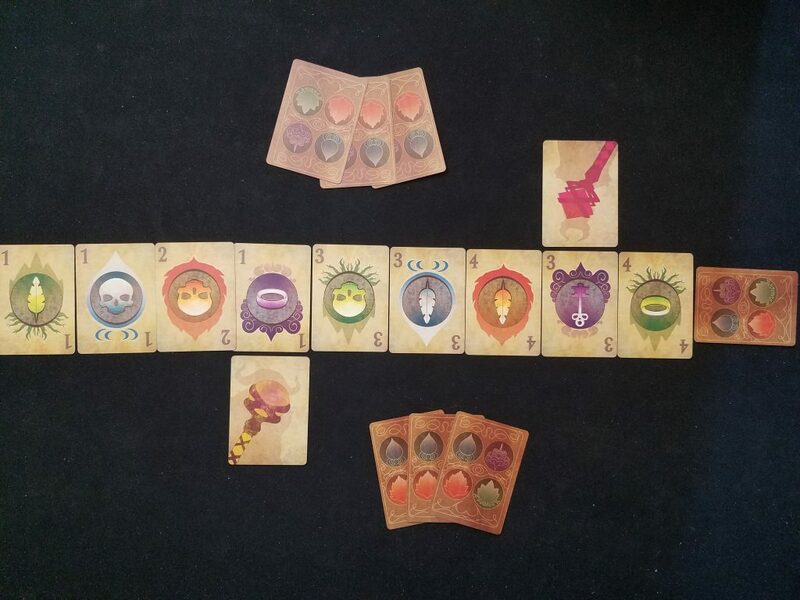 The cards, which each have a number, color, and symbol, are placed in a row, and you, as a wizard, select where on this timeline you will begin. 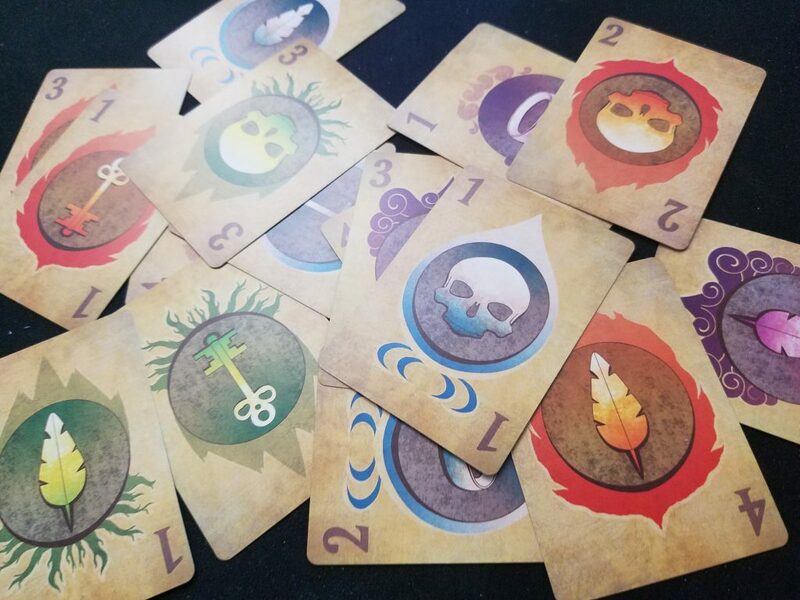 On your turn you’ll play a card from your hand, moving either forward in time a number of spaces equal to the number on that card, or backwards in time to another card that matches either color or symbol. Then you swap the card you played for the card you’ve moved to and see if you can score a “paradox”. 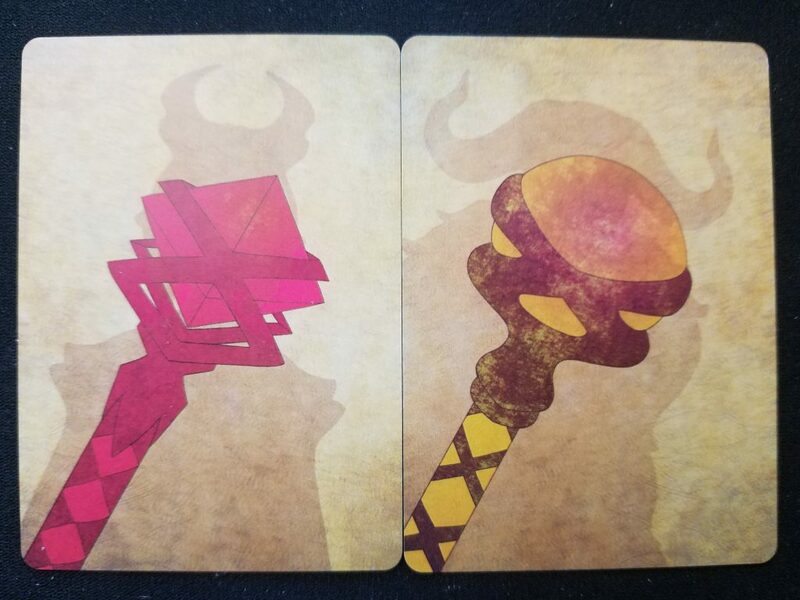 This is done by having a set of three cards in hand that all match either number, color, or symbol. The game is played to 5 points (though you’ll have to supply your own point-counters), and acquiring a point can frequently be a tricky endeavor. We spoke last month about abstract games and their tendency to have lines of play–critical decisions that initiate semi-predictable sequences where you (hopefully) emerge on the other side with an advantage. Antinomy has a similar feeling, though one that can easily be disrupted by your opponent’s own lines. Consider a situation where you have a general mess of a hand. Nothing matches, and you need to figure out what to do. You can use your 3 card to move ahead and grab a second green. Great! But after that play you realize that all of the remaining green cards are behind you, and the only non-green card in your hand doesn’t get you one of them. But if you use it, you’ll swap it for a different card, which may be able to get into position, if you swap it with this other card, to grab one of the remaining greens. The beauty of this thinking is that as you get closer to your goal your options shrink down. Your hand of cards is both scoring and the means to score, which means a clean line will be using one card very carefully to start a chain of plays to capitalize on the other two. Often that’s not possible and you’ll have to do some clever sacrificing or pivoting to find the most efficient means to score. When that happens you feel brilliant. Once I used a card I wanted to score with to get another card in order to go back and get a third card which allowed me to both reclaim the original card I sacrificed and have the right number of movement points to get the third card in the set. It was awesome and you all should be impressed, trust me. That puzzle is engaging as a solo experience, but when you add in another, opposing wizard, it falls a bit short. There are two primary ways your opponent can screw up your plans. First, by simply doing their own thing and stumbling into a block. While this is a game where you could, in theory, track all of the cards and know what your opponent needs, I know I’m not going to play it that way, so all of the blocking in my games felt frustrating. Cries of “you took my card!” were met with “how was I supposed to know you wanted that card?” In the biz we call that sub-optimal interaction. The second way you can stymie your opponent is by clashing with them and stealing one of their crystals. This happens whenever a wizard lands in the same space as their opponent, and the winner is simply whoever has the greatest totaled value among their cards. The winner steals a point from the loser, which seems like it would be too valuable, but given the uncertainty involved clashing is risky. This is part of the game that becomes worse if you track cards, as the uncertainty vanishes and hunting clashes becomes the easily superior play. At that point the game dissolves into something much more laborious as scoring paradoxes opens you up to a greater tempo counterplay. The final wrinkle in Antinomy follows the pattern set thus far: a mechanism that makes sense, but a bit too chaotic and somewhat inelegant. You begin with one of the four colors blocked and every time a paradox or clash resolves the blocked color shifts. While blocked you can’t use any cards of that color in your paradoxes and cards of that color do not count towards your clash total. I suspect without this rule the game moved too quickly with too many one-move scores. With the rule there’s another layer of chaos that can jump in front of your carefully laid plans with little to no counterplay. None of these complaints take away from the fact that the core puzzle in Antinomy is engaging. I haven’t played the solo rules that are bundled with the kickstarter, but I suspect that might be better than the 2 player game. Distill it down to the puzzle and I suspect you’ll get the prime time-traveling wizard experience. Except, of course, actually being a time-traveling wizard. That is clearly better.